John Kerry compares Syria chemical attack to the Holocaust. 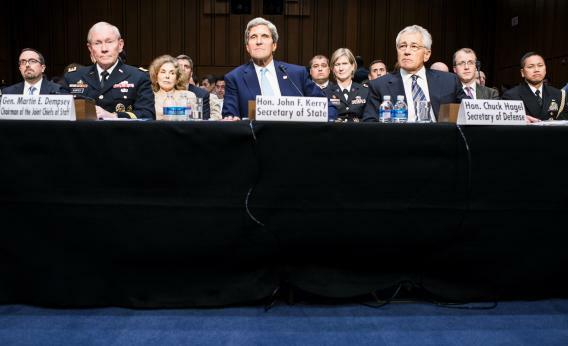 Secretary of State John Kerry compared inaction in Syria to the voyage of the St. Louis. It’s not a question of what will happen if we don’t do it; it’s a certainty. Are you going to be comfortable if Assad, as a result of the United States not doing anything, then gasses his people yet again, and the world says, “Why didn’t the United States act?” History is full of opportunity of moments where someone didn’t stand up and act when it made a difference. And whether you go back to World War II or you look at a ship that was turned away from the coast of Florida and everybody on it lost their lives subsequently to German gas, those are the things that make a difference. And that’s what’s at stake here. The incident Kerry referred to is the voyage of the St. Louis. In 1939, the St. Louis, a transatlantic liner, carried hundreds of Jewish refugees trying to escape the Third Reich from Germany to Cuba. The 938 passengers were turned away in Havana, then Miami, and after the ship ultimately returned to Europe, 254 of its passengers died in the Holocaust—so not “everybody,” as Kerry said. Kerry comparing Bashar al-Assad’s regime to Nazi Germany is to be expected—more than one thousand Syrians were killed by gas, so his argument isn’t exactly Godwin’s Law. But you may assume that the chemical weapons ban upon which the Syrian intervention is balanced was passed after World War II. In fact, the Geneva Protocol’s ban on chemical weapons was signed in 1925, and the U.S. was the “last major industrial power” to ratify the protocol, 50 years after we signed it.